With the possibility of process or equipment alarms, pump failures, or other critical process issues, waste water treatment plant alarm monitoring is a 24/7 requirement. An alarm notification component becomes critical when the treatment facility is not staffed 24/7. The Cypress Ridge waste water treatment plant serves Cypress Ridge community located in Arroyo Grande, California. Manned by a part time staff including Manager, Eric Sweeney, the treatment plant is considered a small plant but very high tech. They recycle 100% of the community’s waste water using the water effluent to maintain the community golf course. In the event of a new alarm event, Eric or a member of his staff receives a phone call with the alarm details. Traditionally, customers who desired phone call-out alarm notification (phone call speaks alarm message, user can acknowledge the alarm with their keypad) have traditionally used TAPI (Telelphony API). TAPI requires a hardware device (voice modem or similar) attached to the monitoring computer (via COM/USB) and an analog phone line. Although widely implemented for call-out alarm notification, TAPI solutions present many reliability challenges. The most common issues are caused by the TAPI hardware device, the analog phone line, and virtual machines. The TAPI device may malfunction due to driver issues and/or compatibility with new operation systems. Analog phone lines may not exist near the alarm monitoring machines (requiring new line installation) and poor phone line quality may affect the success of notification calls. As more users move to virtual machines, the COM/USB interface to the TAPI device must be virtualized and experience has shown that virtualized COM/USB ports do not perform voice functions with the same reliability as physical ports. In the past year Cypress Ridge converted their hardwired TAPI-based telephone alarm notification system to use Voice-Over-IP (VOIP). “Our original TAPI-based phone notification system was unreliable, so we also had the system send text messages because we were missing alarms.” said Sweeney. “There were too many things shaking hands. We had many potential issues including the external TAPI modem and Windows driver issues.” Because of these frequent reliability issues, Sweeney and his staff conducted weekly test calls just to confirm that the communication system was working properly. 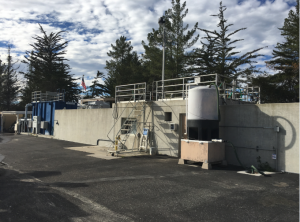 Cypress Ridge was already using Exele TopView Alarm and Notification software for monitoring and notification of the treatment plant alarms. TopView supports numerous notification channels including email, SMS/text, and voice call-out using TAPI or VOIP. With VOIP call-out support, TopView can deliver spoken alarm messages to phones over an Ethernet network. This means that no phone lines or additional physical hardware devices/modems are required to send call-out notifications. The only requirement is a VOIP system (internal or hosted) and a network connection via the internet or LAN.